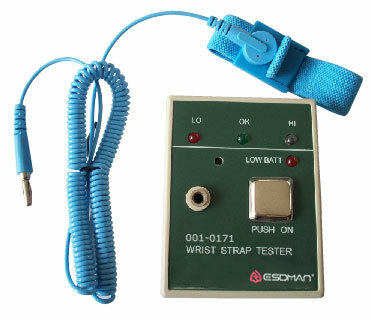 The Wrist Strap tester is a complete body ground test system. It will check the connection while the strap is still on the operator's wrist. Red LED and an audible alarm indicate faulty connection("Fail HI"). Red LED and an audible alarm indicate low resistance or failed resistor ("Fail LO"). Green LED indicates proper grounding("OK"). Test parameters are factory set to 800K-10M(pass), but it’s adjustable to match your own specifications. The unit comes with a 9 volt battery. The test verifies that a continuous path between the operators,wrist strap and ground cord exits.With a test voltage of 9 volts DC,the tester is specially designed to perform this test without harm to the operator. 1. While wearing the wrist strap,plug the banana plug end of the cord into the jack. 2. Lightly press the metal touch button marked"PUSH ON",tester is ready to use. 3. Green"OK"LED indicates wrist strap and ground cord assemblies are functioning properly. 4. If either Red"FAIL LO"or Yellow"FAIL HI"LED's light and the audible indicator sound,operator should check the wrist strap immediately. The Wrist Strap tester is a complete body ground test system. It will check the connection while the strap is still on the operator's wrist. Red LED and an audible alarm indicate faulty connection("Fail HI"). Red LED and an audible alarm indicate low resistance or failed resistor ("Fail LO"). Green LED indicates proper grounding("OK"). Test parameters are factory set to 800K-10M(pass), but it’s adjustable to match your own specifications. The unit comes with a 9 volt battery. The test verifies that a continuous path between the operators,wrist strap and ground cord exits.With a test voltage of 9 volts DC,the tester is specially designed to perform this test without harm to the operator. 1. While wearing the wrist strap,plug the banana plug end of the cord into the jack. 2. Lightly press the metal touch button marked"PUSH ON",tester is ready to use. 3. Green"OK"LED indicates wrist strap and ground cord assemblies are functioning properly. 4. If either Red"FAIL LO"or Yellow"FAIL HI"LED's light and the audible indicator sound,operator should check the wrist strap immediately. Calibration is performed to ensure that the tester is operating within limits.